I was totally called out for slacking on my blogging. Truth is I have been slacking on my baking too. Good news though, I have a mission these next few weeks to get the perfect sugar cookie recipe down. I have tried a couple and I just haven't been pleased. I need a good sugar cookie for our Hanukkah cookies this year. I also think I want to try to decorate cookies - Bake at 350 has some amazing stuff and I want to be like her. It will probably take me a while to figure it out before it makes the blog - or I can let you see all my mistakes and learn along with me. We will see what my pride can take when I try it. :-D So be on the look out for sugar cookies, also this weekend my favorite roommates are coming over! We are having a girls night and making homemade pizzas. Jillian said I have to blog about it - and since she is the reason for this update, I guess I better listen to her! Sugar cookies and pizza! YUM. 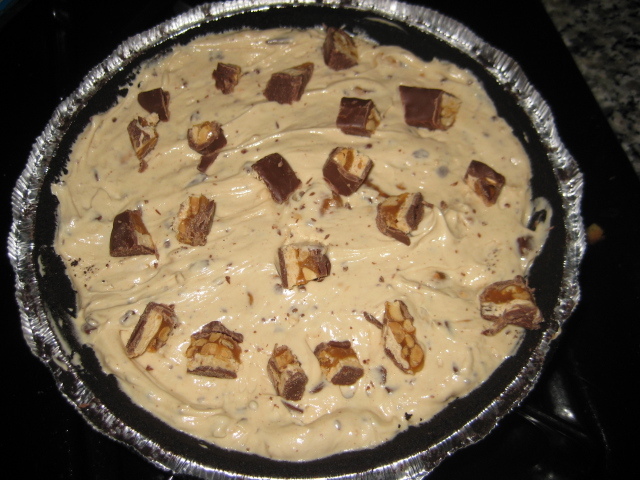 Speaking of YUM - SNICKERS Pie. If you make your own crust you can make 1 larger pie in a spring form pan. Making 2 means you can freeze one!! This was super easy to make and very good! It was really rich and yummy. I would definitely make this again because it was so easy and would be an easy thing to make if you had to take something to a party or pot luck. Thanks! Get ready, I'll be getting my make-up and hair all done for potential blog photos!! Saying you don't like something when you haven't even tried it? I thought you were talking about grape jelly! Oh my how yummy does that look!! Thanks for leaving me some love! You will see your comment once it is approved! We were THAT family...and still are!